On Saturday, November 17, 2018, St. Patrick’s Cathedral in New York filled with members of the Ukrainian Community and concerned citizens of New York and neighboring states to commemorate the 85th anniversary of the man-made famine known as the Holodomor which took place from 1932-33. St. Patrick’s is one of the largest cathedrals in the New York Metropolitan area and is utilized annually to host the thousands of people who attend the yearly Requiem Service. The event began with the solemn procession of Ukrainian American Veterans carrying flags. Entering between the columns of flags proudly held by the veterans was Nadia Severyn, a survivor of the Holodomor, flanked by honorary escorts. Following, were the students of the School of Ukrainian Studies from New York, members of “Self-Reliance”, along with the youth from the Ukrainian American Youth Association. The children filed forward, and solemnly placed single ears of wheat atop those already placed next to the symbolic loaf of bread and lit candle located on a table before the altar. Entering last were the students of the Saint George Academy who slowly made their way to the front and somberly stood holding a poignant black banner commemorating the genocide. As everyone found their places the service began with His Eminence Antony, Metropolitan and Prime Hierarch of the Ukrainian Orthodox Church of the USA and Diaspora stepping up to the podium. Vladyka Antony commented on the gravity of the Holodomor, emphasizing that it was murder by starvation. This horrific event was perpetrated by evil individuals who saw Ukrainians as a threat to the totalitarian regime of the time, and therefore, decided they needed to be exterminated. However, while the plan was to destroy and weaken Ukrainians, today it strengthens us in unity, common cause and a desire to not only remember those who lost their lives, but to ensure that such an atrocity is never repeated upon any nation. Good will always conquer evil, and to that end Metropolitan Antony asked that everyone stand and join in prayer. 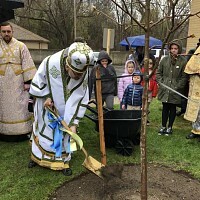 His Eminence was joined by Bishop Paul Chomnycky of the Ukrainian Catholic Church, Archbishop Andriy Rabiy of the Ukrainian Greek Catholic Church of Philadelphia, along with the clergy and faithful from numerous Ukrainian Orthodox and Ukrainian Catholic parishes. The prayers were accentuated by the hymns sung by the “Dumka” Ukrainian Choir, under the direction of Vasyl Hrechynsky. Joining the faithful were various diplomats, and members from various Ukrainian organizations. Guest speakers included Andriy Futey, President of the Ukrainian Congress Committee of America; His Excellency Volodymyr Yelchenko, Ambassador Extraordinary and Plenipotentiary, and Permanent Representative of Ukraine to the United Nations; Consul General of Ukraine in New York, Oleksiy Holuboy, who read the appeal of Valeriy Chaly, the Ambassador of Ukraine to the U.S. The participants sat quietly contemplating the words spoken by everyone who came up to the podium. Tears rolled down their cheeks as they heard retellings of horrific stories, details of how lives were lost to such cruelty and inhumanity. Everyone sat mesmerized as they listened how the Bolsheviks purposefully, and with evil intent, perpetrated one of the worst acts in human history. While we would hope history would not repeat itself, today we find Russia once again behaving with aggression towards its peaceful neighbor, Ukraine. Historically the world had turned a blind eye to the murder of millions, however today Andriy Futei read a letter from Senator Charles Schumer, in which he declared that the United States Congress unanimously recognizes the Holodomor as an intentional genocide perpetrated against the people of Ukraine. The Memorial Service concluded with Bishop Paul Chomnycky expressing his sincere gratitude to all the hierarchs, clergy, diplomats and guests who attended the prayer service to commemorate the Holodomor, as well as to the “Dumka” Choir for adding a sense of otherworldly beauty to such a solemn event. As the service concluded, those present exited through the large doors, taking with them the somber mood and the realization of what they had just been commemorating. Spreading out through the streets of New York, Ukrainian descendants along with non-Ukrainian neighbors mulled over what they had heard, mumbling together in the little groups, shaking their heads in astonishment that such things could happen, and then walking off to their own homes to share what they learned tonight with their families and friends. While 11 million people lost their lives, they will not be forgotten, and their sacrifice has served to not only strengthen Ukrainian resolution, but, the resolution of the entire world to be vigilant and to intervene if such hostility should ever resurface against any nation. 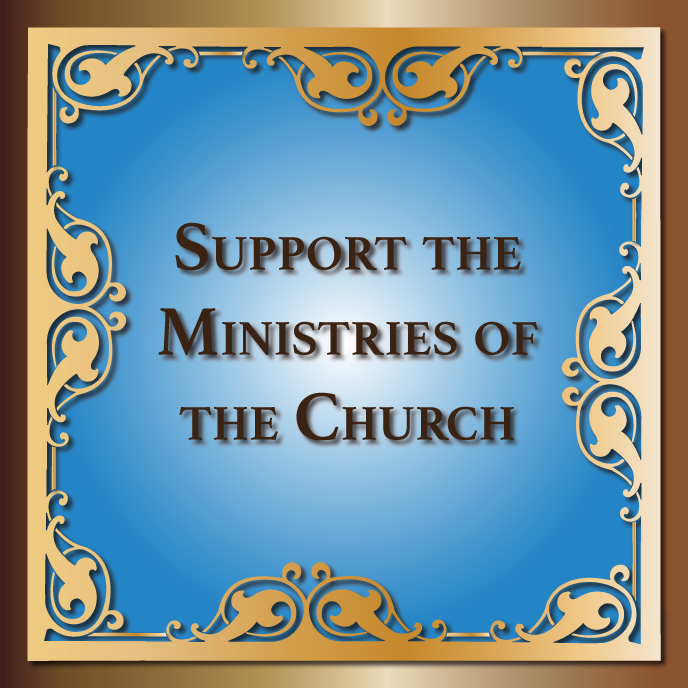 May the Lord remember the souls of those lost to Holodomor in His Kingdom.